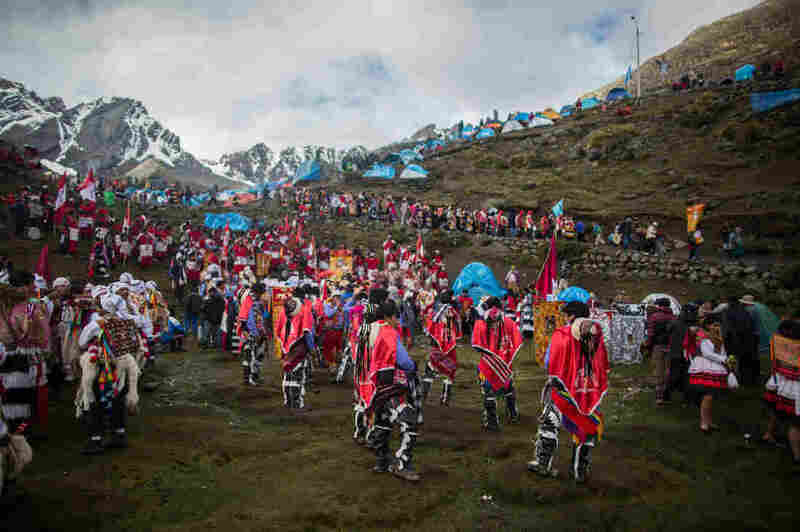 On Sunday, 100,000 Peruvians Gather For A Festival At A Holy Glacier — Only The Glacier Is Melting : Goats and Soda That's the sad situation facing thousands of Peruvians who climb a mountain for the 'Snow Star' festival, which starts on Sunday. The yearly festival is called Qoyllur Riti — Snow Star in the Quechua language. 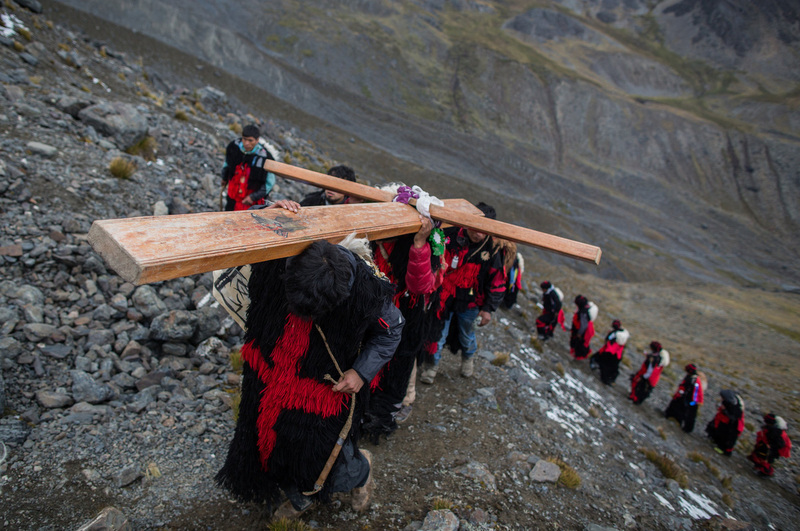 Wearing traditional garb as well as special outfits made for the event, worshipers travel many miles by truck, then face a steep six-hour hike to get to the site. On Sunday, May 22, over 100,000 Peruvians are expected to arrive at a site in the Andean highlands near the peak of Ausungate, in the southeastern region of Cusco. They may have traveled hundreds of miles to get there. At an altitude of 16,500 feet, they'll camp out, sing, dance and pray at the holiest — and one of the biggest — religious festivals in the Andes mountain chain. It's called Qoyllur Riti, which means "snow star" in the local Quechua language. These days, the festival is an example of how climate change is affecting far more than daily life and agriculture. The mountains here are considered sacred by the worshippers and known as "apus," or mountain spirits, gods. The tradition is for each province represented at the festival to carve out heavy chunks of ice from the glacier — symbolic of water and life — to bring back to their communities. 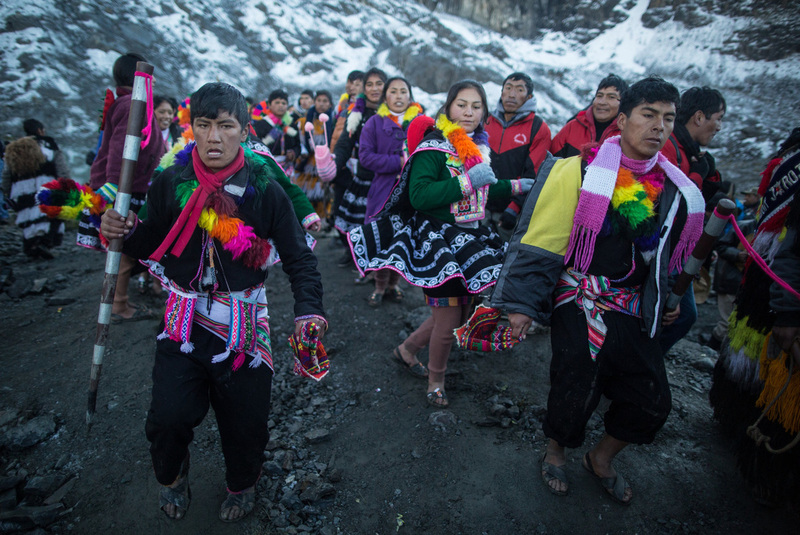 "We can't take snow down from the glacier anymore," says Walter Mamami, a participant from the Canchis province. "The glacier is getting smaller. We now stop at the foot of the glacier." Each province represented at the festival used to carve out heavy chunks of ice from the glacier — symbol of water and life — to bring back to their communities. The festival itself is a combination of native and Catholic traditions. It celebrates the reappearance of the Pleiades constellation in the night sky, marking the start of the Andean new year and the harvest season. There's a Christian context as well: According to a legend, in 1780, a fair-skinned boy appeared to a young shepherd who lived in the mountains, then turned to stone when suspicious villagers came after him. The belief is that the boy was Jesus. That was a time of tension between the local peoples and Spain, which ruled Peru from the 16th century until the 1820s. Spain tried to quash the Indian language and culture. But in the case of the festival, the two cultures, Spanish and Andean, became intertwined. I visited the festival last year, following a group of official guardians of the Qoyllus Riti tradition, known as pablitos in Spanish or ukukos in the local language. The pilgrimage itself is a test of endurance, a penitence of sorts. It takes days to arrive as villagers travel in open trucks most of the way, stopping in every village along the way to pray, dance and sing. There's lots of coca-leaf chewing and nonstop music to keep the deeply devoted pilgrims going with little or no rest. Worshippers disembark in Mahauyani, the furthest trucks can go, before hiking another six hours to cover the final steep 6 miles to their destination. The festival has both native and Catholic traditions. On the vast plain in the glacial basin of Sinakara, surrounded by snow-covered peaks, a cacophony of round-the-clock music and prayers blares from loudspeakers at the chapel on the site. People come wearing their community's traditional dress as well as special outfits made for the festival. "Hairy" woolen robes worn by the ukukos are a reminder of a mythical bear, believed to live in the surrounding mountains. Meanwhile colorfully dressed male dancers bounce around carrying what looks like a stuffed baby llama on their backs. "The glacier receded a lot," Jaime Rios Farfan, from the Acomayo province, told me after he returned from the main ritual at the foot of the glacier — 1,500 vertical feet higher than the camp site — held at sunrise. "We prayed and asked Apu Qollqupunko [the name of the peak], that the glacier not recede any more, that it not disappear." At the celebration in years past, each community had its own area in the snowfields where it would carry out its rituals and prayers. Participants from the province of Paucartambo said only muddy land remains in its reserved area. "It's a sad reality," says Rios Farfan. If and when the glacier disappears, "It will threaten peaceful coexistence between the groups," says Javier Felix, an anthropologist, speaking of possible tensions between those communities that might still have a sacred area on the glacier and those that don't. He lamented that many of the younger "guardians" didn't appear to understand the importance of the glaciers to the spiritual traditions. "The elders understand," he adds. What the elders can't understand is why no one seems to care about earth's changing climate. "The big factories and all the garbage are destroying the ozone layers. Over here while it used to be all white, there are more and more rocks," admits Rios Farfan. Indeed, last year at the festival, local chiefs criticized the world's disrespect for Mother Nature.